The owner of the Waikiki Edition Hotel in Honolulu has filed a lawsuit against Marriott International Inc. and boutique hotelier Ian Schrager, claiming that the hotel has been a failure due to gross mismanagement and Marriott’s inability to successfully launch the Edition brand. The news was announced by Bickel & Brewer, which filed its lawsuit in New York Supreme Court on behalf of M Waikiki LLC. The lawsuit seeks tens of millions of dollars in damages and the right to terminate the agreement with Marriott, the operator of the 353-room hotel. Bickel & Brewer also announced that its client has issued a notice of default against Marriott, claiming that Marriott not only breached the management agreement, but, as M Waikiki’s agent, also “breached its common law duties to Owner, including the duties of care, loyalty, candor, and full disclosure.” The notice demands that Marriott cure all defaults within the required 30 days. When the Edition brand of boutique hotels was publicly announced, Marriott’s President and Chief Operating Officer, Arne Sorenson, stated that its “Success will be determined by one thing only: how many of these we can open, and how well they perform.” Despite Marriott’s representation in 2007 that it had agreements in place to open nine hotels in major cities worldwide within the year, with up to 100 more coming soon thereafter, there are only two Edition Hotels today – the Owner’s Waikiki Hotel and a 77-room Istanbul property that opened just last month. The lawsuit claims that defendants failed to deliver the pre-opening design and development assistance that was promised, and Schrager – despite his contractual obligations to do so – had little involvement in the development of the Hotel project. The lawsuit explains the dire financial circumstances facing the property – with dismal occupancy rates and soaring costs. Since its opening, occupancy levels at the hotel have been below 38 percent. During the same time period, the overall occupancy level of the Hotel’s competitive set – those properties with whom it directly competes – is 74 percent, according to the lawsuit. The lawsuit says that since its opening, the Waikiki Edition’s RevPAR index is 37.3; an index of 100 would reflect that the Waikiki Edition is operating at a level equal to its competitors. To top it all off, the lawsuit says that, “Schrager abandoned Edition (and Owner) to create his own lifestyle hotel brands, one or more of which is expected to compete directly with Edition Hotels.” Schrager announced plans for one of those new brands, PUBLIC Hotels, last week. “We believe defendants abandoned our clients – and their promise to do all that was necessary to make Edition a viable competitor in the ‘lifestyle’ hotel marketplace,” Brewer says. Brewer is joined in representing M Waikiki by Bickel & Brewer partners James S. Renard and Michael S. Gardner, and firm consulting director David Matthiesen. To view a copy of the legal filing, click here. 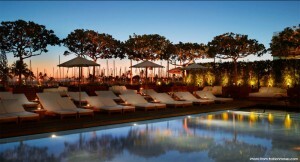 M Waikiki is a Hawaii limited liability company with its principal place of business located in San Diego, California. It is a special purpose entity, having approximately 75 indirect investors, which was formed to acquire the hotel. Bickel & Brewer has earned a reputation as one of the most successful law firms in the United States practicing exclusively in the field of complex commercial litigation and dispute resolution. With offices inNew York and Dallas, Bickel & Brewer represents a wide spectrum of industry leaders – from entrepreneurs to Fortune 500 corporations – facing the most challenging of legal issues. Visit Bickel & Brewer at www.bickelbrewer.com. Umm remember the old biz school lesson – LOCATION LOCATION LOCATION?? This hotel, while very nice inside, IS NOT where the action is in Waikiki – not really visible from the road, doesn’t have a beach, and doesn’t offer any real sweet deals for kamaina. Just because you get some BravoTV reality “stars” occasionally (paid) to hang out there it’s not enough to get any momentum going..